Since the company was founded, Mindray has been continuously exploring new ways to improve diagnostic confidence. 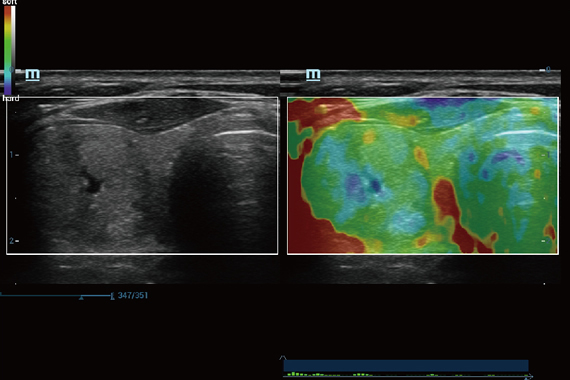 Powered by the most revolutionary ZONE Sonography® Technology, Resona 7’s new ZST+ platform brings ultrasound image quality to a higher level by zone acquisition and channel data processing. 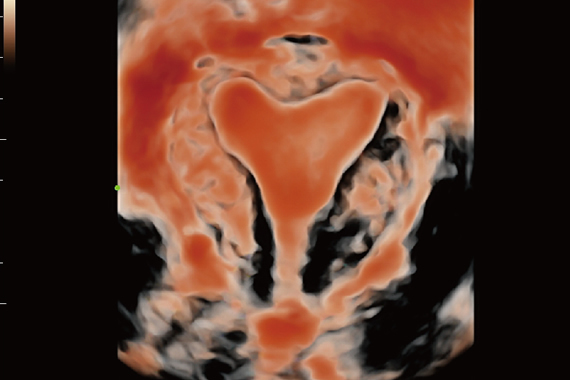 As well as the premium level image quality, Resona 7 also enhances clinical research capabilities with the revolutionary V Flow for vascular hemodynamic evaluation, and the most intelligent plane acquisition from 3D datasets for fetal CNS diagnosis. 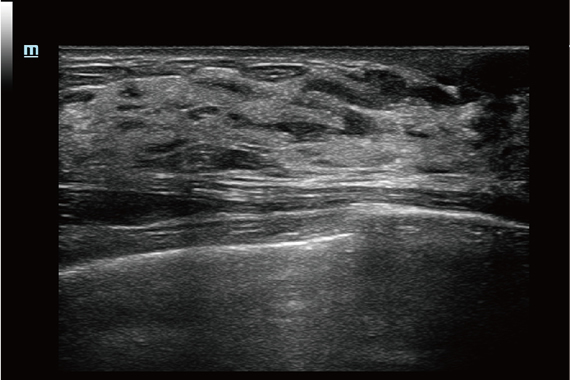 Combining the most intuitive gesture-based multi-touch operation and all the essential clinical features, Resona 7 is truly leading new waves in ultrasound innovation. 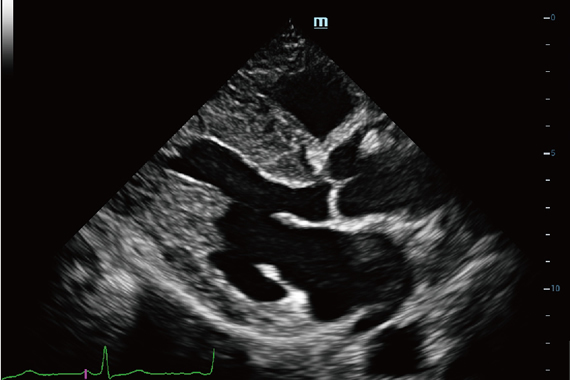 The channel data based ZST+ is an extraordinary innovation, representing an ultrasound evolution. 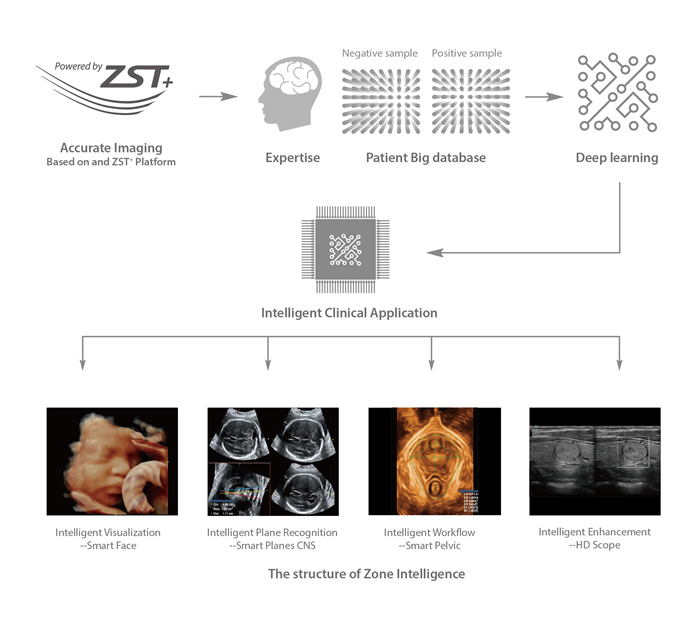 Transforming ultrasound metrics from conventional beamforming to channel data based processing, ZST+ is able to deliver multiple imaging advances: Advanced Acoustic Acquisition, Dynamic Pixel Focusing, Sound Speed Compensation, Enhanced Channel Data Processing and Total Recall Imaging. By transmitting and receiving a relatively smaller number of large zones, Advanced Acoustic Acquisition extracts more information from each acquisition, 10 times faster than a conventional line-by-line beamforming method. Dynamic Pixel Focusing technology allows the Resona 7 to achieve extreme uniformity at the pixel level throughout the entire field of view. Now there's no need to adjust the focal position to achieve uniformity across patient exams. 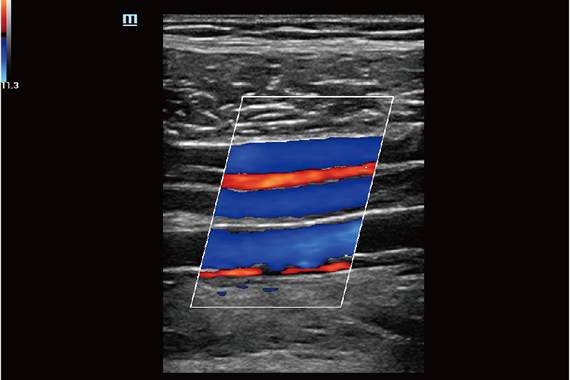 By retrospectively analyzing complete channel data stored in channel data memory, the Resona 7 is able to intelligently choose the optimal sound speed to improve image accuracy even with tissue variation, allowing for adaptive tissue-specific optimization. Channel data based ZST+ provides Enhanced Channel Data Processing for greatly improved image clarity. By multiple and retrospective channel data processing, it makes the best use of acoustic information for image improvement. 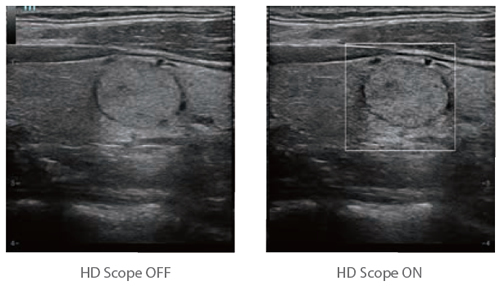 HD Scope: higher definition image within ROI. ZST+ captures and stores the complete acoustic raw data set. 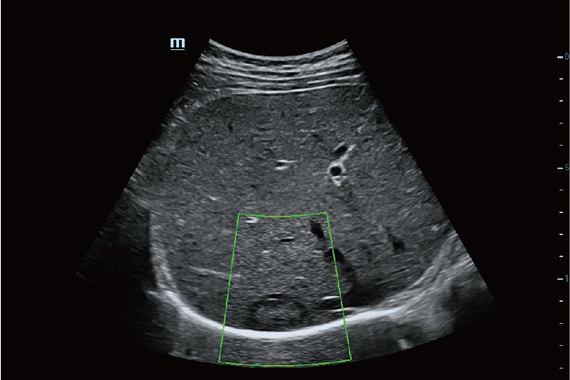 Total Recall Imaging allows the system to do retrospective processing on channel data and also permits users to modify numerous imaging parameters on stored images to maximize clinical output. 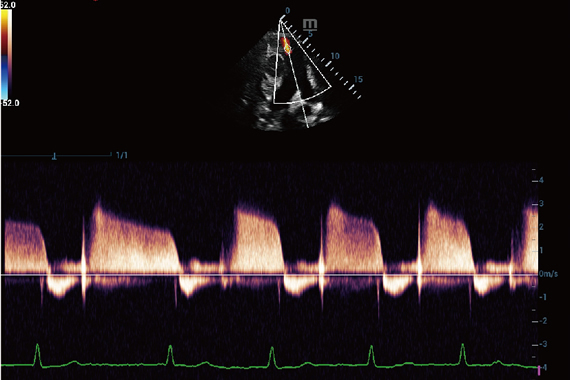 V Flow (Vector Flow) is a novel approach for vascular hemodynamic analysis. V Flow uses color coded vector arrows to indicate the velocity’s magnitude and direction of blood cells. With ultra-high frame rates, it provides extremely accurate and angle-independent visualization of complex vascular hemodynamic profiles. With comprehensive data information, V Flow is the most valuable tool for vascular clinical research. UWN+(Ultra-Wideband Non-linear Plus) CEUS enables the Resona 7 to detect and utilize both the 2nd harmonic and non-linear fundamental signals, generating significantly enhanced images, resulting in greater sensitivity of minor signals and longer agent duration with lower MI. STE is integrated with Mindray’s exclusive Ultra-wide Beam Tracking technology for real time 2D shear wave elastography. The integrated measurement tools enable comprehensive quantitative elastic analysis. Meanwhile, the operator independent STE ensures good reproducibility and highly consistent quantitative elastic results. Bringing the precision of fusion imaging to a new level, Mindray’s innovative and exclusive respiration compensation technology - supported by a sensitive magnetic motion sensor with millimeter accuracy - can help eliminate distortion and fusion inaccuracy caused by patient respiration. The Resona 7 elevates clinical intelligence with a complete solution that enables clinicians to manage both routine and advanced studies more efficiently,consistently, and accurately, from acquisition to calculation. 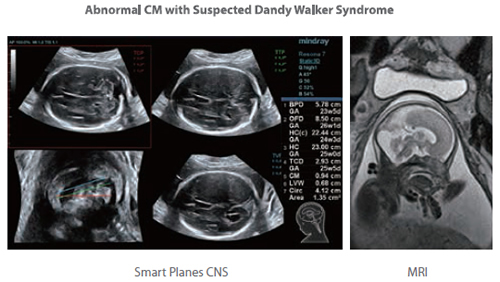 As an example, Smart Planes CNS shows exceptional intelligence in accurate diagnosis and analysis of the fetal central nervous system (CNS). 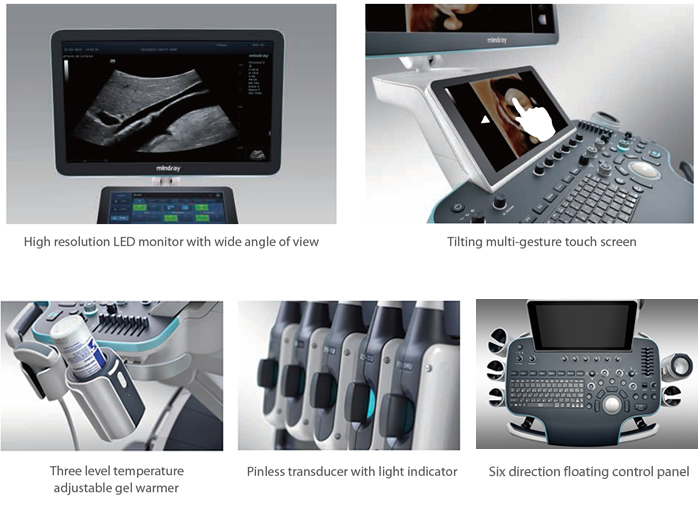 Mindray’s exclusive pioneering technology positions the Resona 7 as the industry’s first ultrasound system to allow fully automatic and accurate detection of the most significant planes and frequently used measurements of fetal CNS, leading to intelligent diagnosis, improved throughput, and reduced user dependence. Smart Planes CNS provides a user-friendly tool that greatly improves scanning efficiency through increased accuracy coupled with automated operation. 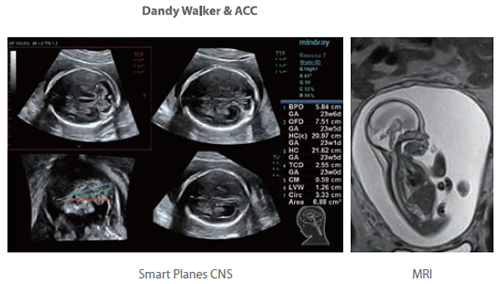 With a simple button click on a 3D fetal brain volume image, the standard CNS scanning planes (MSP, TCP, TTP and TVP) and a range of related anatomical measurements (BPD, HC, OFD, TCD, CM and LVW) are obtained immediately. 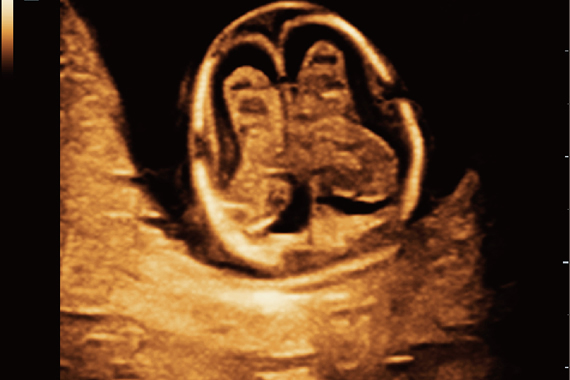 Acquiring an optimal view of the fetal face in 3D ultrasound is cumbersome and time-consuming. In some cases, it is impossible to get rid of the occlusions such as cord, placenta, uterus and extremities. 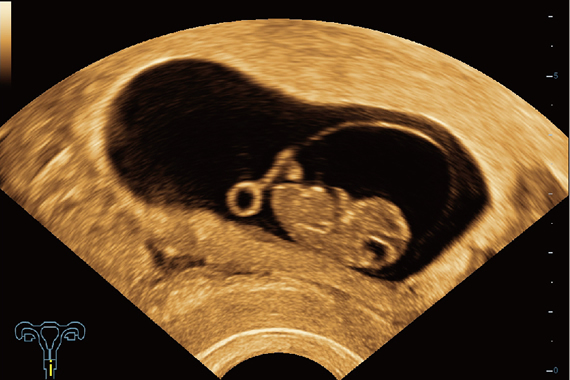 The new Resona 7 with Zone Intelligence provides a fast and intelligent optimization for fetal face with simply one-touch. 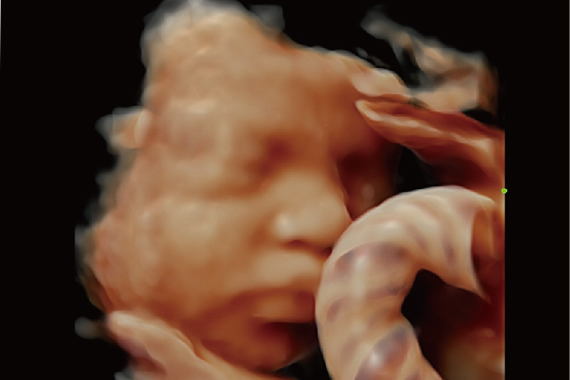 It can immediately remove occlusions in the volume data, eliminate unwanted noise information, and generate an optimal view of the fetal face with minimal effort. 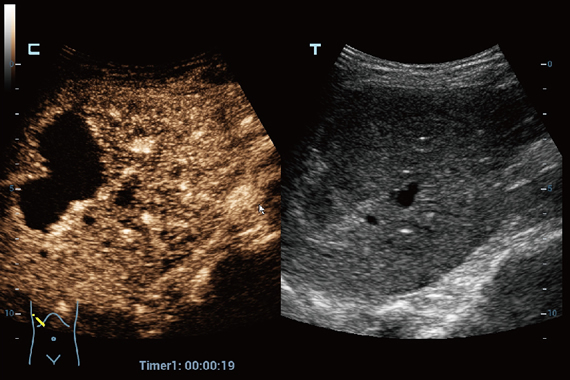 Realizing the increasing importance of ultrasound diagnosis on pelvic floor disorders, the new Resona 7 with Zone Intelligence provides a new solution to greatly simplify the operation procedures, and minimize the exam time for standardized evaluation of the pelvic floor. With extremely simple user-interaction, it generates a standard coordinate system and automatically provides all related measurements within a few seconds. The Resona 7 is designed around you. 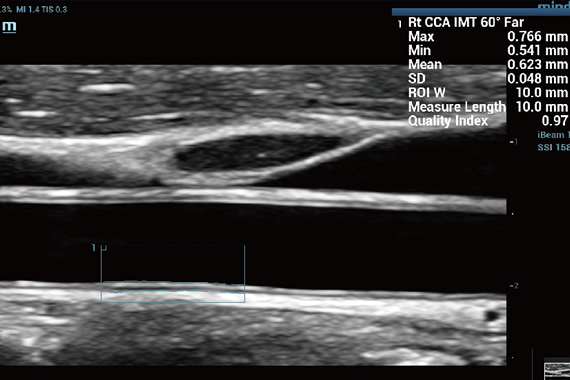 Gesture-based operation opens up a new trend in cart-based ultrasound with an agile, smart, and intuitive user experience beyond your expectations. Gel warmer’s three level temperature and swiveling angle adjustment of the control panel delivers great patient comfort and user convenience.